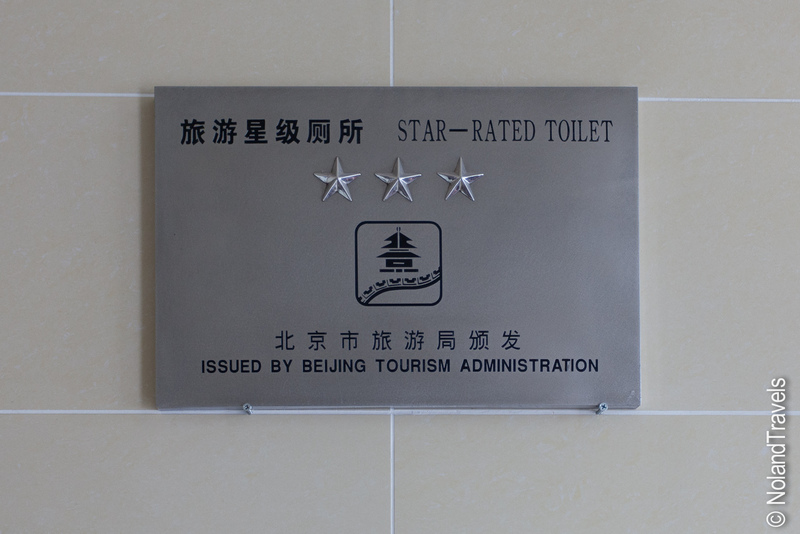 We also found out yesterday that there is a bathroom star rating system! Somebody google and see if there is an app or website that locates them all. 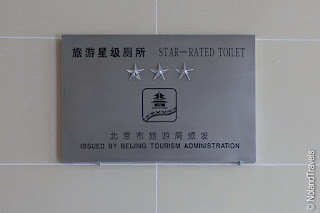 We hit a 3 star and 4 star bathroom yesterday and compared to some of the um, barely-tolerable-even-for-guys-bathrooms we've had to suffer through, these were clean and worth the star rating. The stall doors in the men's were even complete with a number and picture of how to use the toilet. Very helpful indeed. 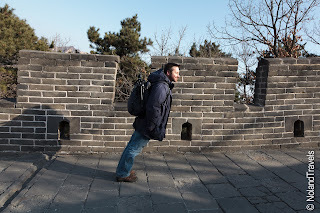 ...well, I couldn't have that, so we booked an excursion out of Beijing to Mutianyu, to visit a section of the Great Wall. This portion of the wall was originally built in the Northern Qi Dynasty (550 – 557) but a major portion was rebuilt by the Ming Dynasty (1368 – 1644). You can explore a nearly 2.5 km stretch while traversing big inclines as you make your way from watch tower to watch tower with the wall winding its way across the top of the mountain. Although its set in rugged countryside, surrounded by mountains and forest, this place is by no means a secret due to its proximity to Beijing. There is a cable car to take you up and down and for the more adventurous, there's an exciting toboggan ride down! Yeah...of course, we took the toboggan! We ended up with a fantastic winter day to explore the wall. 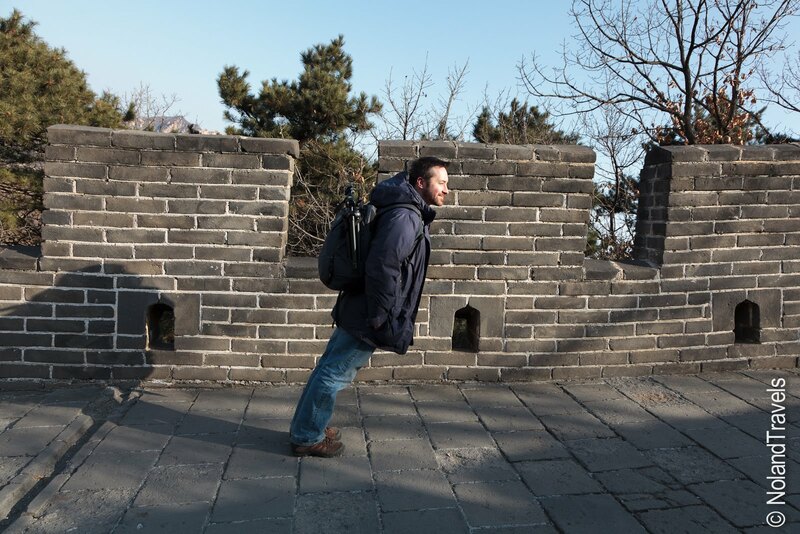 The sun was shining, the wind was calm and the skies were blue, which only added the awe of seeing the Great Wall. However, you quickly realize this isn't a causal stroll in the park. To cover a lot of ground it's daunting! The wall sits high up on a ridge of the mountain, so of course it follows the natural terrain. 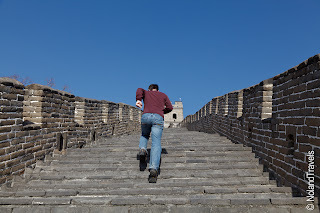 You start walking - scaling the inclines, staggering down the declines, climbing the uneven and at times gigantic steps, which only lead to more and more of them. Up, down and around you go, following the path laid for you so many years ago. It was surreal. 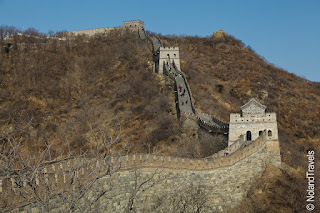 Thinking of the old school Chinese guards on patrol, standing watch and occupying the houses, along with coming to grips with how small a portion of the wall you were actually seeing. Mind boggling! Then as we found out in Mongolia, it didn't even work! 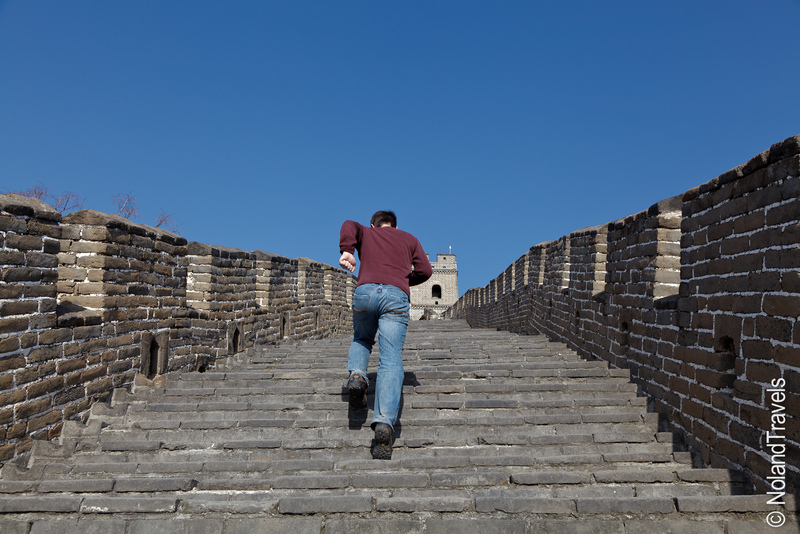 Ghengis Khan found a way around this great structure to take Beijing, its primary reason for being built. Anyway, we climbed our fair share of the wall making it to gate 14 when we spied the seriously l-o-n-g uphill climb to gate 23 and decided the view was much better from below! Other than hiking and enjoying the crisp beautiful day, we did make some new friends as you can see in the photos. And there's photographic evidence that I did indeed climb the wall. Whew - my manhood is safe! 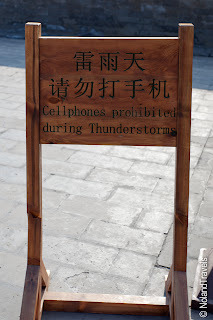 One sign we can read! Not surprisingly they have tweaked the menu adding star shaped fried fish cakes along with a Peking Duck wrap complete with hoisin sauce! It's officially the year of the Dragon - 2012! The fireworks are still sounding in the city. 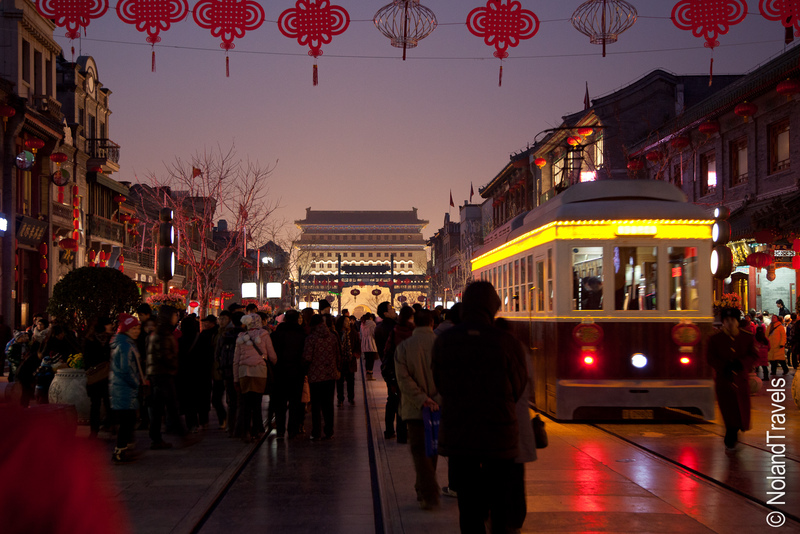 Chinese New Year or 春節, translates as "Spring Festival" which is the most important holiday of the year. There are family feasts on New Years Eve, traditions of giving lucky money to kids, burning fake money, dragon and lion dancing and of course fireworks! The festival ends 15 days later culminating with the Lantern Festival. By fireworks, I don't necessarily mean big organized shows. Families set them off at their doorstep to drive off the evil spirits and start the new year with good fortune. All throughout the day you could hear zips, bangs and other firework noises in all parts of the city. At times you'd be walking down the street and here a big CRACK. Turning around you see a kid holding his ears after just setting off a firecracker. In the couple hours leading up to midnight on NYE it sounded as if the city was under siege - a constant rumble of explosions all around you! Along with the festivities, we have been sampling some of the local cuisine including dumplings and peking duck! 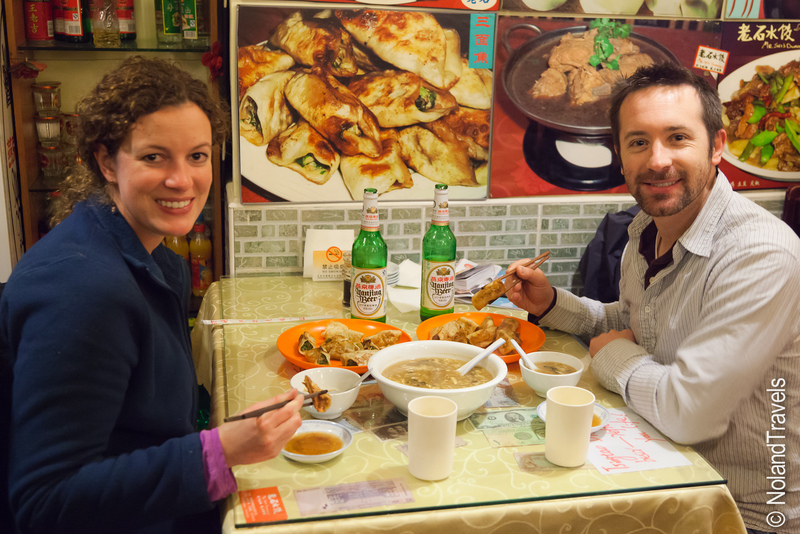 Dumplings are a New Years tradition and we found a fantastic little dumpling restaurant called Mr. Shi's Dumplings. We ordered two plates of dumplings and two soups, but they quickly said, no, no to the second soup. We understood why when they served us what seemed like a gallon of Hot and Sour soup! For dumplings fillings we opted for mutton and carrot along with pork and fennel - both were delicious. And Mr. Shi even took our photo. A great find! 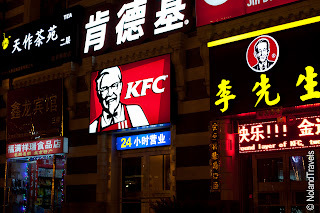 The other big ticket food item to have in Beijing is Peking Duck. With the help of a guilde book tip we stumbled into Bianyifang's to try their version which they have been perfecting for 150 years! Before we could order though, we had to have a look through their extensive menu of Duck foot with mustard, wine drunk duck heart, braised sea cucumber and pigs blood and oxtail soup, to name a few! We settled on the standard Peking duck with pancakes, cucumber, spring onion and hoisin sauce. 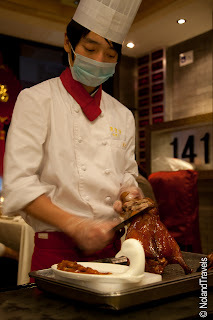 To enhance the experience, a chef came out and carved the duck at your table. We polished it off nicely! 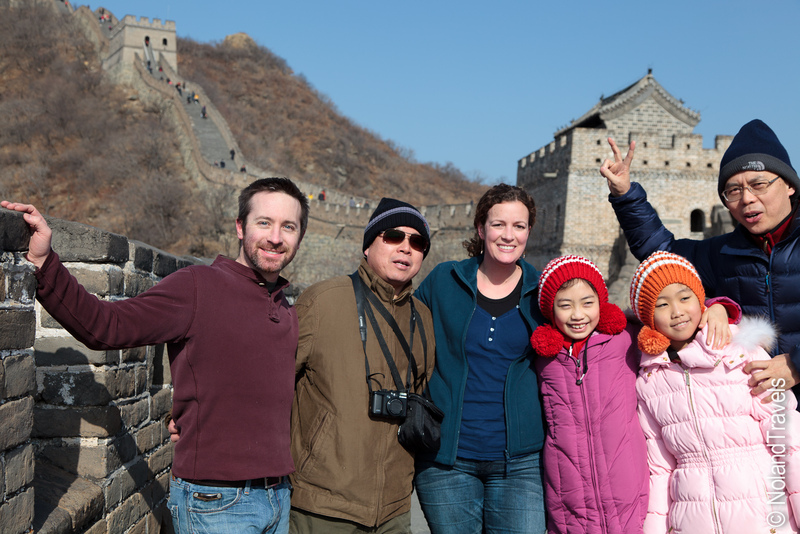 In between New Year's festivities and eating we are making it around to the sights and look forward to visiting the Great Wall on Friday. We got a glimpse of it on the train when we arrived but can't wait to see it up close. We have lots of content to post but we are having internet issues. Email is sketchy at times and the blog is er, um, BLOCKED! Blogger is apparently off limits, along with other favorites like You Tube, Twitter and Facebook. So, I'm trying a new approach, blog by email so we will see how it goes - the formatting may be a little off. That's all for now. Happy travels. So when do you decide to take a career break? 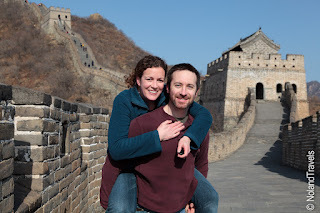 Before we dive into the Russia portion of our trip, I wanted to provide a little more detail on why we're taking a career break to travel and why we're doing it in this style (pretty much unplanned). I know some of you think we're crazy (and we are) so we want to justify our madness. It dates back a couple years…we'd been in London for over a year and knew we were already facing the end of Steph's secondment (but also thought we already wanted to stay longer). We thought it would be perfect to take a break between living in the UK and US to travel. When else are we going to have such an understandable break from work? Many people in the UK and Europe take gap years after they finish the equivalent of US high school and before starting university. When various people told us about their own gap years it made us really think that Americans were missing a trick not doing the same. We've all known people who weren't quite ready or mature enough for university and we've also grown to believe there is SO MUCH to be gained from travel. Gap years are brilliant. That concept is somewhat why we went to London in the first place. By the time we had matured enough in university to realize that some worldly travel might be really cool, we were both too far along in our studies to make it where we could not find a semester abroad that offered courses that would be suitable for both our degrees. Missing that travel opportunity as a student was our one regret in life (so far!) which we remedied with moving to London After moving to London and traveling quite frequently, we soon caught "the bug" and have been travel addicts since! So with all of that in mind, we knew for sure that we had to take a break between the UK and US to travel. We were also desperate to get to Asia since we were mainly traveling Europe while living in London. One of our first ideas was in the post about the Oz bus. Sadly it went through some places that Americans shouldn't (and can't) go! And we ultimately decided that would be way too much time on a bus covering ground and not enough time experiencing. 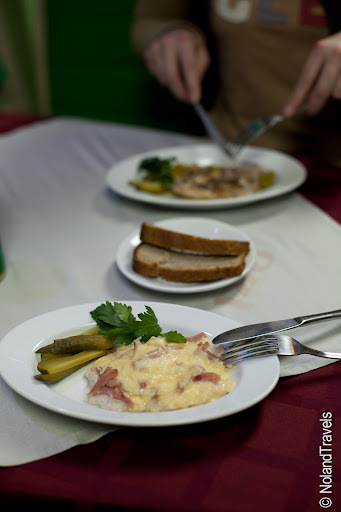 In the three months leading up to the holiday season and our eventual departure from London, we had a lot on our plate. Decisions, logistics, packing, sorting and getting rid of stuff to name a few things. So in all of the hustle and bustle we needed a way to start the trip that would allow us to "ease" into traveling. Different from the last few years of maximizing travel, we hoped to slow things down with a new type of travel - slow and unplanned! Well, we're both naturally "planners". Steph has organized most* of our trips over the past five years, booking hotels and excursions and both of us reading and planning all of the many things we have to see and do. So, we want to challenge ourselves a bit - throw ourselves in to the unknown. * In the more recent years, in being very busy with work and life we have set off on a couple trips absolutely last minute (booking 2 days before for Corfu, Greece) and completely unplanned (Zurich, this past summer) and they have turned out to be some of the most memorable and special trips we've had. We're hoping that the same "enjoyment from the unexpected" will come from our unplanned long travel. As the days counted down we started throwing out ideas. Overall we knew we wanted to focus on Asia - Vietnam, India, China and ocean-front huts like in Tahiti or Bali were hot on our list. Steph came up with the winning plan after a few drinks late in a pub one night, "Let's start by celebrating Chinese New Year in China!" (She sends a special thanks to Nicholas for recommending this one…on another late night…in a pub with the obligatory curry afterwards). Ok, sounds good but when is that? For 2012 it is January 23rd. The time line fits. Ok, so where do we start? Dunno. Then on a Saturday afternoon Steph dragged us to a travel store to investigate Round the World flights, trip insurance and travel vaccines...all the stuff that Steph is good at organizing. 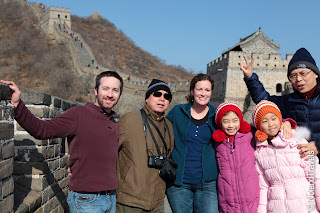 While waiting for an agent, we were flipping through their Asia book and came across the Trans-Mongolian trip that ended in Beijing just before Chinese New Year. Russia was always a place on of our list but somewhere along the way we just never really made happen for one reason or another. We had already dismissed it for this long travel because we knew it would be way too cold to start there in January. However, after reading that brochure blurb about it, we looked at each other and knew the Trans-Mongolian is where we wanted to start! 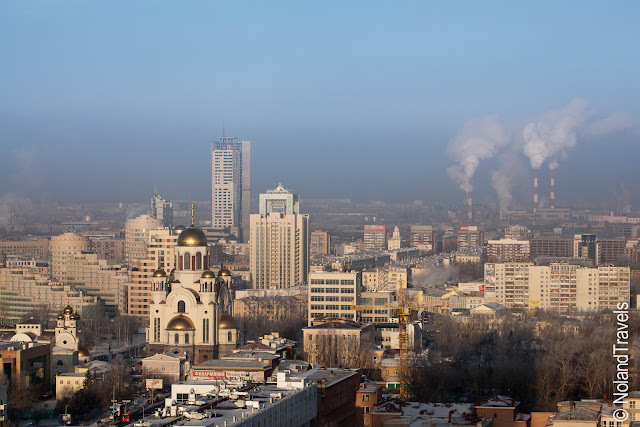 So with eagerness the agent called us forward and already knowing a RTW flight probably wouldn't work for us since we wanted to do so much land travel, we quickly shifted the conversation to booking this particular Trans-Mongolian ending just in time for Chinese New Years. He typed away on his screen and came back with a "sorry, I'm afraid its all booked up". No! Devastation! We then spent the next 2-3 days googling for any other company to offer a similar trip with roughly the same timelines but strangely it's not high season... It was finally found, buried in the pages of google - a reputable company, offering a quality trip at a decent price. Should we really go in January? Really, it's going to be, excuse my English, bloody cold!? So, Steph called upon a couple colleagues from Russia and asked if we were crazy for going to Russia in January. They both said no, it's fine; Maria even thought London winters were worse because it was more humid and wet! And my friend Oleg, while telling me I was crazy at the same time, said it was a good time to go... Alright then - book it! Here is our rough itinerary starting the 31st of December 2011. A big shout out to my brother and Tara for the great New Years Eve send off and the first leg of the journey! 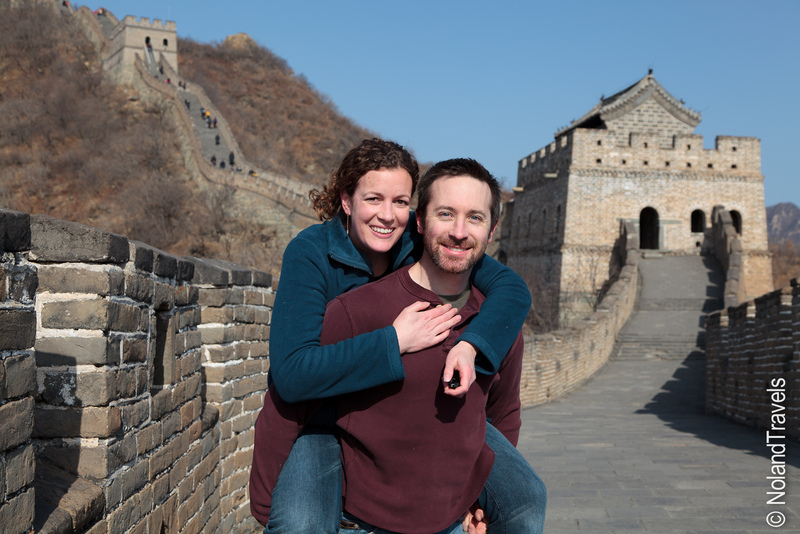 Then a few days in Beijing to see us through Chinese New Year, hopefully catching up with my colleague and his wife. By my count that's roughly 11,000 miles as the crow flies and 13 timezones in 20 days! Yep we are insane but loving it! 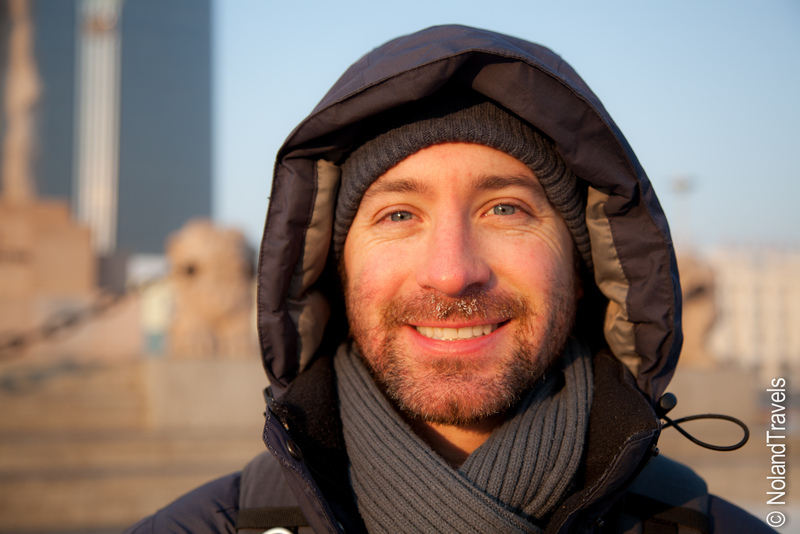 We made it to Mongolia - wow, it's cold! 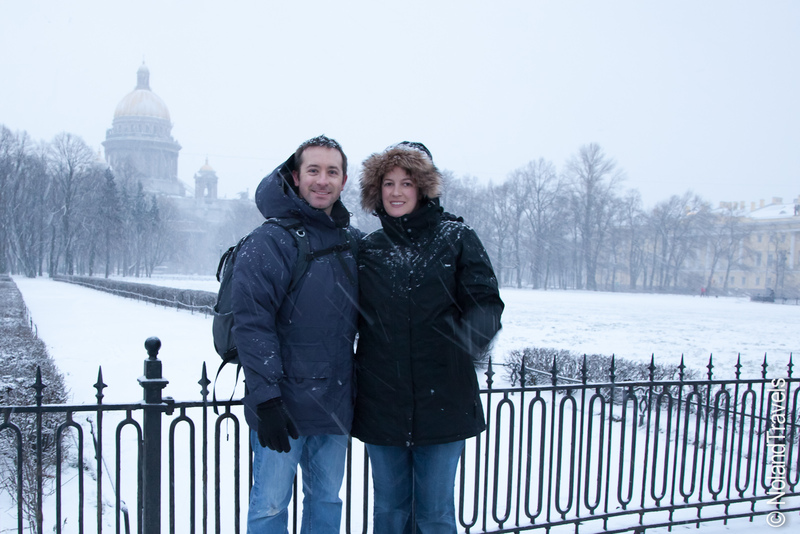 When initially planning this trip, we knew that it would be cold in Russia and really cold in Mongolia. It's the heart of winter but we saw it as an extreme experience that we wanted to try. Luckily we were able to edge our way in to the extreme cold. 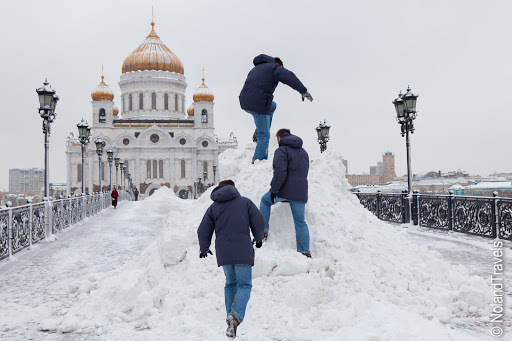 St Petes and Moscow were hanging around 19 F (-7 C) and Yekaterinburg was around 7 F (-14 C). The latter proving cold enough to where I got a little hesitant when it came to wondering around looking for food! So, when we arrived at the train station in Ulaanbaatar at 6:30 in the morning, before the sun was up - wow! That was cold, -16 F (-27 C). A simple breath in and you instantly felt your nose hairs freeze. You almost felt scared for your lungs! The fabrics on our coats even changed from a gentle woosh-woosh sound when walking to a crinkly, crackly plastic crunchy sound! After a few minutes wandering around on the platform looking for our driver, cheeks tingling, the cold had already gone through our gloves! Later that morning when we jumped out of the van for a quick walk across the main city square, within 10 minutes Josh had nice ice-cycles developing on his beard! We will post a bit more later about the details of what we got up to in these extreme temperatures, but this morning at the Ger Lodge, out in the countryside, it was -29 F (-34 C) with the sun just up! Needless to say, the night before when Josh tried to take some long exposure star trail photos, he only managed the one photo below before jumping back in the Ger before both him and the camera started to freeze over! It's really been an amazing experience here in Mongolia, even if brief. We head off tomorrow morning bound for Beijing in the last leg of our Trans-Mongolian journey! Today is our last day in Yekateringburg and really our last day in Russia. Just after midnight tonight we board the train for Mongolia but it takes 70+ straight hours on the train to get there. Yep, a little over 3 days with only a few 20 minute stops until we reach Ulaanbaatar. Hopefully we should be able to put together a nice collection of blogs while we're on the long train journey because we have some good photos and stories to share. The days are flying by! On top of the short winter days, its light about 10am and dark again at about 5pm, we've been going at a strong pace. Yesterday was dog sledding in the Urals forest and today was ice fishing at Sharkash Lake, where Steph pulled off a pretty good trick (we'll let the suspense build...). And all of this after our last manic months in London and a busy Christmas home means we're actually really looking forward to some rest on the train. 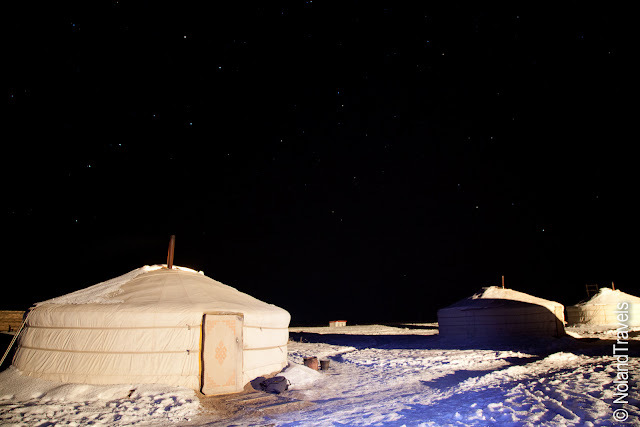 The forecast for Mongolia is...well, COLD, about -18 Celsius or 0 Farenheit, with night time lows of -30 C / -24 F! Yikes! 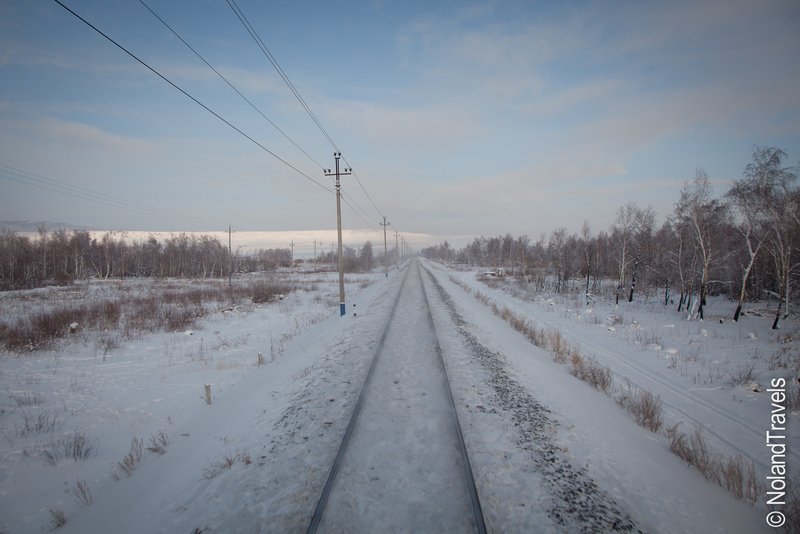 So, with our bags packed and loaded down with some typical train food (pot noodles, sweets to share, vodka, etc) we're ready for the longest train journey we'll probably ever take, across stunning Siberia! Merry Christmas (in Russia, anyway)!! Today is Christmas day in Russia since they celebrate according to the Julian calendar which is 13 days later than the newer Gregorian calendar that we follow. It's been good fun being here during this time as the country is enjoying 10 days of holiday and there are lots of Christmas stalls, lights, decor, events, etc going on. 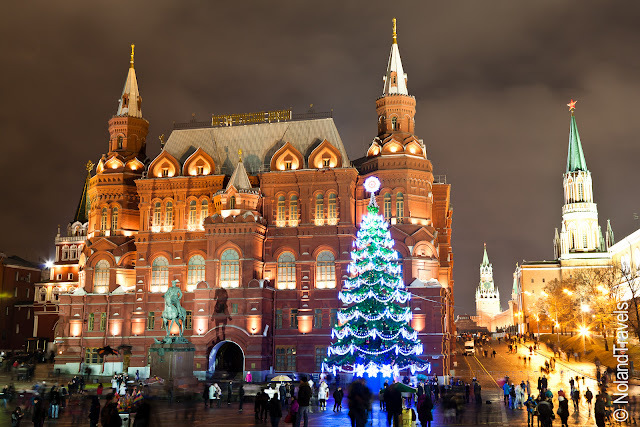 Last night (Christmast Eve), we were in Red Square enjoying the sights and sounds when we heard choir singing from one of the smaller churches on the edge of the square. We decided to go in and found ourselves in the midst of an amazing candlelit Russian Orthodox Christmas service. We were on our tiptoes trying to see in to the really small center room where the service was being held (maybe 50 people max standing inside!) and a guy came by saying something in Russian pushing people out of the door and back in the entry hall. We thought we were being ushered out but then everyone just made a uniform space in the entry hall and we realized the Bishop and priests, in their fabulous gold and cream robes, were making a processional around the church halls - swinging incense and bells and carrying large candles. We felt so lucky to have caught this moment - it was amazing to see the Russian Orthodox celebration of Christmas. In addition to catching this service, we also captured some fairly good photos. 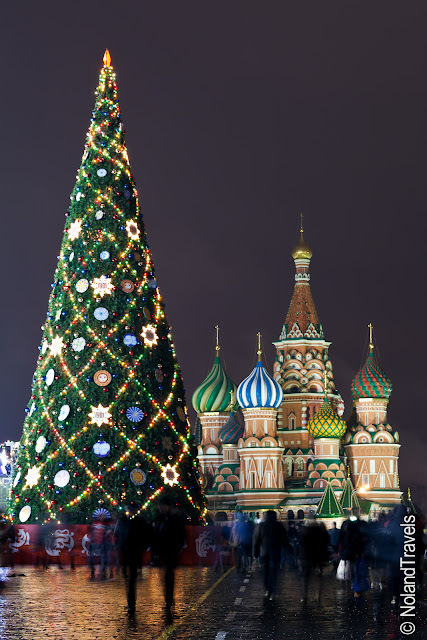 Merry Moscovian Christmas! The start of a new journey: Welcome to Russia! So after the slight packing challenge we boarded our flight and set off. In an ironic twist, we changed in London which was odd arriving but not staying there! Then we arrived in St Petersburg, Russia on the evening of 2 January. We were a little disappointed that there wasn't any snow but mother nature had a little surprise for us the next morning! Here is a picture to set the scene - we'll post more about what we got up to later...we have to go catch our 10pm overnight train to Moscow!